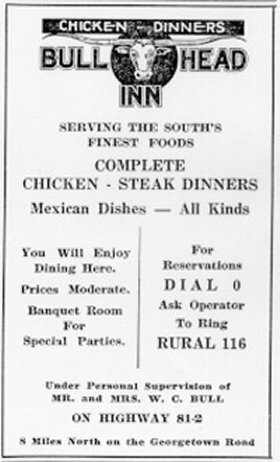 The earliest restaurant in the Copperfield area known to me is a steakhouse called the Bullhead Inn. The Bullhead Inn was located on what is now a vacant shrub-covered spot about a hundred feet south of Yager and about three hundred feet or so east of North Lamar. Note: I have not yet identified the exact location. On May 15 and 25, 2000, Mr. Luther Fox of Austin (Fox/Kellam house --Archaeological Remains in Copperfield / Northeast Austin) was interviewed regarding his memory of the Bullhead Inn. His remarks have been combined and condensed here. The owners of the BullHead Inn were named Bull. The owner Mr. Bull once told my grandfather, H. N. Dillingham, that Bonnie and Clyde had stopped and eaten at his restaurant. I am a witness to him telling this to my father. I was there . . . . I think Mr. Bull said that he saw Bonnie and Clyde go into Dillingham Pasture one night. They may have camped out in Dillingham Pasture. It's a secluded place. There was a lot of thick cedar trees in there. The location of the Bullhead Inn was a little back of the building there [most likely Titus Electric]. A fence line ran just east of the little building. It was along that fence line a little south of where those buildings are [buildings on Yager Lane]. They had a house there next to the BullHead Inn. The Bullhead Inn was east of the house and right against the fence. An old lane went down to that house. I was only four or five years old when I was in that restaurant. I think it was a medium-sized restaurant, and they had a patio for use in the summer.